Vineyard Style Magazine: Community Sail Martha's Vineyard Dedicated to Protecting and Perpetuating Our Island's Maritime Heritage and Culture. Dedicated to Protecting and Perpetuating Our Island's Maritime Heritage and Culture. Sail MV is a non-profit organization dedicated to connecting Vineyarders to the Island’s maritime heritage. The summer training program began in 1994 with just eight kids and one volunteer instructor, and has expanded to reach about four hundred students every year, with up to fifteen professional teachers. Sail MV also offers programs for teenagers and adults, both on the water and in the classroom. Director Brock Callen is constantly looking for ways to increase and improve programs. “I wake up every morning with a smile on my face,” he says. “The opportunity to work with kids on the water–it just doesn’t get any better than that. One of the things we’re most proud of is that we still do what we do for Island kids for free.” There’s a $50 membership fee for the beginning classes for 8- and 9-year-olds and subsidized tuition for the more advanced summer classes, for Island residents. 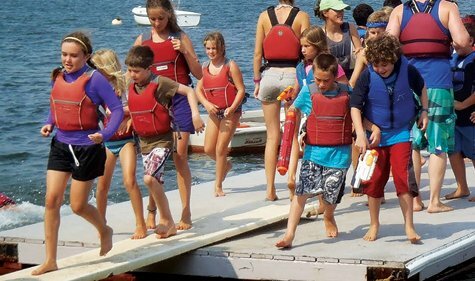 For those local families who might not be able to afford the camp, Island Food Products has provided a scholarship fund. Islander Jesse Thomas started out with the summer program. “I enjoyed being outside and on the water, but at the beginning it was about hanging out with my friends,” he says. As he went on, he became a member of the high school sailing team, and says that the combination of the sailing and competition really drew him in. “My goal now is to help some kids find the same love of sailing that I have, but it’s not for everyone. I want to give back to Sail MV because they’ve given me a lot,” he says. “We teach kids to sail, not to race,” Brock says, but Sail MV also supports the high school sailing team, and runs a fall racing clinic for middle school and high school students. Last year, the MVRHS sailing team became the top-ranked team from a public high school in New England and one of the top four in the region. “The MV high school teammembers had all been racing together and were all long-time friends, they wanted to win,” says coach Andrew Burr. The team usually has about 15 to 20 members, and has been around since the mid-1990s. In the classroom, Brock has developed a three-year maritime sciences curriculum for high school students which is serving as the model for a state-wide curriculum. Graduates of that program have gone on to work on all sorts of boats, from tugboats to ferries to yachts. For adults with more experience on the water, he teaches United States Coast Guard 6 PAC and 100 Ton Masters licensing courses every winter, open to about 12 students a year, plus other continuing education classes. There are on-the-water programs for adults, too, including summer sailing classes and rowing. “The adult sailing program has been catching on in the past few years and is gaining traction,” Brock says. “We’ve always had a good program but it’s clear that the adults would like more.” Jude Villa, chairperson of Row MV, started rowing over ten years ago in Cornish pilot gigs which were built by volunteers here in 2004-206. “It’s a great way to get exercise and to really experience the elements,” Jude says. “You get to meet a very diverse group of people and really get out and learn about the tides and the wind. It’s very fulfilling, it’s meditative and recreational and spiritual.” About thirty adults participate in the rowing club, and there’s also a smaller youth rowing program. Sail MV relies on donations and volunteers for much of its work. Every summer The Vineyard Cup Regatta, with its seafood buffet and silent auction, has been the organization’s major fundraising event since 2006. This year’s regatta will be held on July 8th, 9th, and 10th. Brock says that the auction committee is looking for high quailty auction items, and that businesses can support Sail MV through advertising in the program booklet, as well. Sail MV has done all this with their summer fundraisers, membership contributions, individual and community donations and grant support. Please help them continue their mission. For more informtion or to make a charitable corporate, or personal, contribution click on sailmv.org, e-mail: admin@sailmv.org, or call: 508-696-7644.